What do a former U.S. government contractor, an amnesiac spy, a super soldier with a large “A” on his forehead, and two ordinary teenagers have in common? 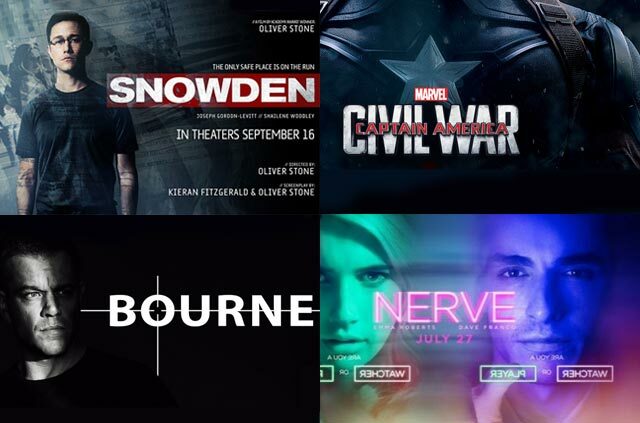 Answer: They’re the lead characters in this year’s biggest privacy-related blockbusters! 2016 has delivered a smattering of great films, from talking animals (Zootopia) to superhero satire (Deadpool) to more talking animals (The Jungle Book, Finding Dory, and The Secret Life of Pets). In particular, four films have delivered pulse-pounding thrills while touching on fundamental issues of anonymity, surveillance, and security. So dim the lights and fire up your popcorn machines as ExpressVPN breaks down four of the best from the past few months. Oh and, spoiler alert! Snowden reminds us online freedom is a fundamental right worth fighting for, no matter the cost. Kicking off the list is the biggest privacy-related blockbuster in years. 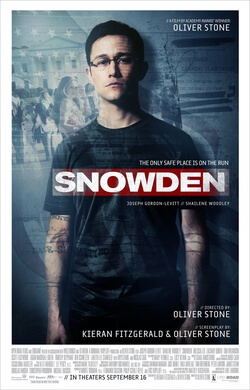 Snowden chronicles the transformation of the extraordinary whistleblower from an idealistic 20-something discharged from the U.S. army to a reclusive government contractor who would go on to expose the CIA’s unsettling surveillance capabilities. The central idea explored in the film is whether privacy should be sacrificed for security. Corbin O’Brian (Rhys Ifans), a high-ranking CIA suit who’s also Snowden’s boss, teaches his protégé (Joseph Gordon-Levitt) that any and all means of surveillance are justified when it comes to combating foreign threats. Snowden, however, eventually distances himself from O’Brian’s philosophy as he witnesses firsthand the unethical practices used by the government to trace targets online. Throughout the film, director Oliver Stone makes it clear he’s on Snowden’s side, and reminds us even our most innocuous interactions with the web can be traced, recorded, and analyzed by government officials behind locked doors. As a film, Snowden is a tense and heart-wrenching drama that faithfully sketches the life of Edward Snowden. But more than that, it is a launchpad for debates on privacy and a tribute to a man who will long be held as a champion for internet freedom. You wanted it. You waited for it. And finally, almost a decade later (because Legacy doesn’t count), Jason Bourne (Matt Damon) is back on the silver screen. 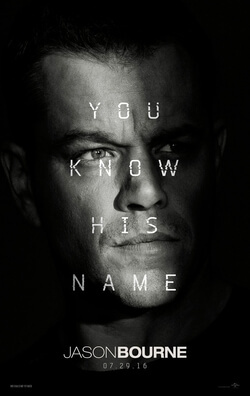 With Bourne’s origins pretty much explored in the previous trilogy, this bone-crunching fifth installment delves into David Webb’s family history, following Bourne across the globe as he unravels the truth behind his late father’s involvement with the CIA and eventual demise. As the camera-shaking action gets cranked up to 11, Jason Bourne also highlights some important issues on social media and mass surveillance. In the film, young tech tycoon Aaron Kalloor (Riz Ahmed) is the face of privacy in the internet age. While at a Las Vegas tech conference, Kalloor tells a cheering crowd his Facebook-like creation, Deep Dream, will “personalize” user experiences without sharing user information with other parties. If that sounds too good to be true, that’s because it is. Social media platforms like Facebook and Twitter (and Deep Dream) collect every smidgen of personal data you submit online, using it to suggest friends you might know, recommend events you might want to attend, and serve you targeted ads. A quick read of their privacy policies will tell you these platforms also have the right to share your information with other unknown parties. What’s worse, it turns out Deep Dream was partially funded by the U.S. government, who intends to turn the social media platform into a massive real-time surveillance program. If Kalloor submits to government requests for a “backdoor” into Deep Dream, all of the profiles, messages, and visited locations shared on the platform would become government data. Epic fight scenes, emotional character interactions, and a timely discussion of autonomy vs. security. What’s not to love about Cap 3? Besides being the highest grossing movie worldwide for 2016, Captain America: Civil War is also a heart-breaking tale about accountability, skeletons in the closet, and betrayal. The film’s inciting incident is a superpowered showdown in Lagos, the horrifying consequences of which forces the government to reign in the Avengers in an attempt to place them under government oversight. 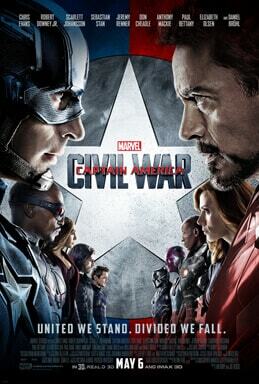 At the center of this conflict stands Captain America (Chris Evans) and Iron Man (Robert Downey Jr.). Cap, having fought the Nazis in The First Avenger and experienced the downfall of S.H.E.I.L.D. in The Winter Soldier, is wary of government authority and believes the Avengers should not answer to any external committee that could be corrupted by power. Stark, still recovering from his guilt in Age of Ultron, chooses to accept public accountability and welcomes U.N. oversight for the team. As the two allies bicker over their philosophical differences, a horrendous incident from Stark’s past, involving Cap’s best friend Bucky (the Winter Soldier), fractures the Avengers and ignites a civil war. Should the Avengers, and other general means of civil protection, be government-sanctioned? Does becoming government-sanctioned make any future actions performed by the Avengers (or general law enforcement) morally acceptable? Where should a government draw the line between protecting its civilians and removing their personal liberties? The film does not provide an easy answer to these questions. And as Cap risks life and limb to save his friend and the unity of the Avengers, it’s clear that the fight for privacy and security in our world is no less difficult. Nerve: The new fad after Pokémon GO? Have you ever wondered what would happen if people took the game “Truth or Dare”, digitized it as a downloadable app, and turned that into a streaming service? Well, the folks behind Nerve did, and it’s definitely not fun and games. The Ariel Schulman-Henry Joost directed flick stars Emma Roberts and Dave Franco in a taut thriller where a seemingly harmless online reality game is revealed to involve life-threatening stakes, all while questioning our own participation in similar digital offerings. The eponymous game features “players”, who complete challenges for money, and “watchers”, who pay to watch players complete the challenges they post. Average high school senior Vee (Roberts) meets fellow Nerve player Ian (Franco) while she completes her first challenge, and together the duo complete increasingly dangerous tasks until they find themselves at the top of the rankings and fighting for their lives in the final round. 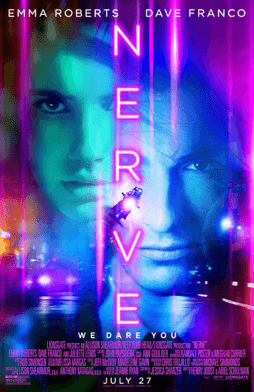 At its core, Nerve examines the impact of services such as Facebook Livestream and YouTube Live. Will you do things you won’t normally do if your actions were watched (and rewarded) by millions worldwide? Will you encourage others to perform life-threatening acts if you can hide behind a wall of online anonymity? The film depicts the devastating consequences that occur when netizens abuse internet privacy in the name of entertainment and allow the promise of online stardom to influence their actions. While the film’s setting and action may seem fantastical, Nerve’s central message is that such a world is far closer to reality than we would often believe. That’s ExpressVPN’s wrap-up on the year’s four biggest privacy-related blockbusters. Do you agree with the ideas explored in these films? Which one was your favorite? Were there any other films that should have been featured here? Share your comments below, and make sure to catch up on this year’s best films if you haven’t already! No doubt all great movies! Each movie has a common theme with anonymity and real life. Thank you for posting!